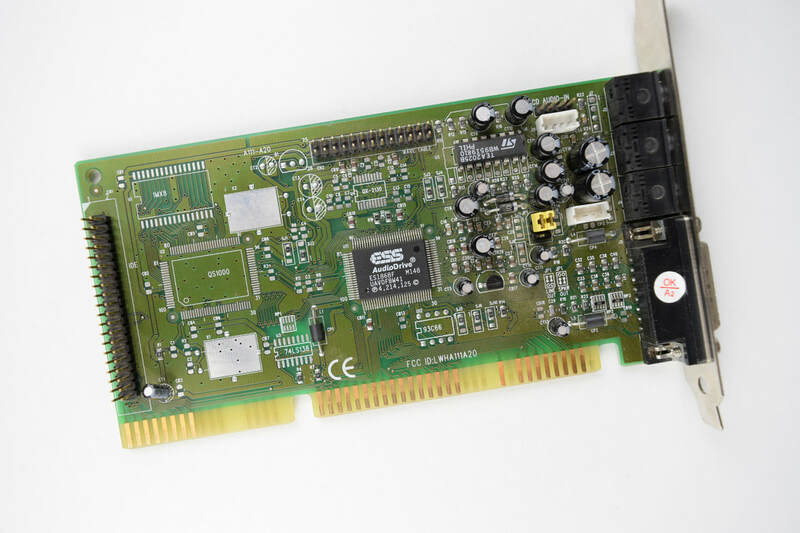 ESS AudioDrive ISA Sound Cards are some of the best Sound Blaster clone cards. The chipset is highly integrated and the ES1868F for example offers Sound Blaster Pro 2 compatibility, has mixer inputs for line-in, microphone, CD and wavetable and is a really quiet card. Most cards also have an IDE connector for an optical drive, which can be very useful in machines with just a single IDE channel. The card has jumpers to enable / disable an amplifier. For powered speakers or going into an external amplifier it is recommended to disable the onboard amplifier. The DOS software is beginner friendly, just run INSTALL and you get asked a few questions. The program than updates your AUTOEXEC.BAT and CONFIG.SYS files. The entries made are easy to read, understand and modify. For example if you later want to change the interrupt or a mixer setting, just edit AUTOEXEC.BAT. ESS AudioDrive ISA Sound Card with ES1868F chipset. This is for the 1869, which is slightly improved with a higher 48 KHz sample rate and 3D ​Spatializer technology.